We needed a ladder for a pitch to a dig (frequently visiting) better lasting than leaving an electron (and less "take-able"). To many angled squeezes for a ridged one. So the above is made of chains and 10mm steel bars MIG welded onto the links. I have tested a sample for load (static and dynamic) and you could allow elephants to climb and jump on it in fact the bolt (large ring bolt) would give way first. 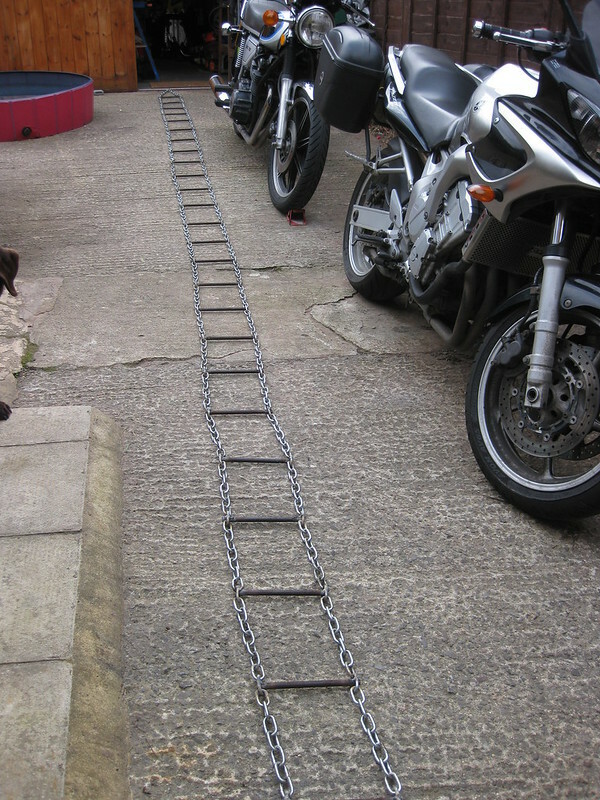 Seems to work the length is 7M weight 15Kg max load for the chain is 450Kg (static) so a reasonably sized elephant The welding may have compromised the max load slightly. Bro, elephants weigh a few tons. Unless you forgot to add an extra "zero" to that 450kg lol. Great looking chain though, I think it'll serve that purpose well.